When night falls, it’s time to go to work, says Akito Kawahara. The scientific bias toward daylight, he says, has left darkness somewhat unexplored. Part of the reason is that the nocturnal world can be challenging for conducting research. It is difficult for humans to see and the sounds that organisms make at night are often at a frequency too high for humans to hear. Studying night life in an ecosystem often required clunky equipment so disruptive that it altered the very behavior of an organism a scientist might want to observe. Much of that equipment — high-powered cameras with night lenses, hypersensitive microphones, and laptops — now fits in a backpack or two, and that has opened up the world of night to scientific inquiry on a scale not seen before, Kawahara says. Akito Kawahara, an assistant curator for the McGuire Center for Lepidoptera and Biodiversity in the Florida Museum of Natural History. Kawahara began working in that world on ultrasound, trying to characterize the sounds moths make, and through that process theorized that moths make an “anti-bat” ultrasound. To test the theory, Kawahara teamed up with Jesse Barber, a bat researcher at Boise State University, and went to Malaysia, Mozambique, Borneo, Ecuador and other locations, trekking into the dark to study the predator-prey interactions of bats and moths. They found that moths are not always an easy dinner for bats. Over millions of years, many moths, hawkmoths among them, have evolved to produce ultrasound to jam the sonar of the attacking bats, an effective escape maneuver. Bats hunt with echolocation, sending out ultrasonic sounds that echo off a target and give a bat enough information to zoom in for the kill. Hawkmoths, it turns out, can jam bat sonar, and they do it by using their genitalia. Kawahara and Barber have discovered that many different moth families use anti-predator ultrasound as a defense mechanism, leaving the next step in the evolutionary arms race up to bats. The McGuire Center holds one of the world’s largest butterfly collections. With a strong research emphasis, the center has collaborators on nearly every continent. Recently, the National Science Foundation funded two grants. 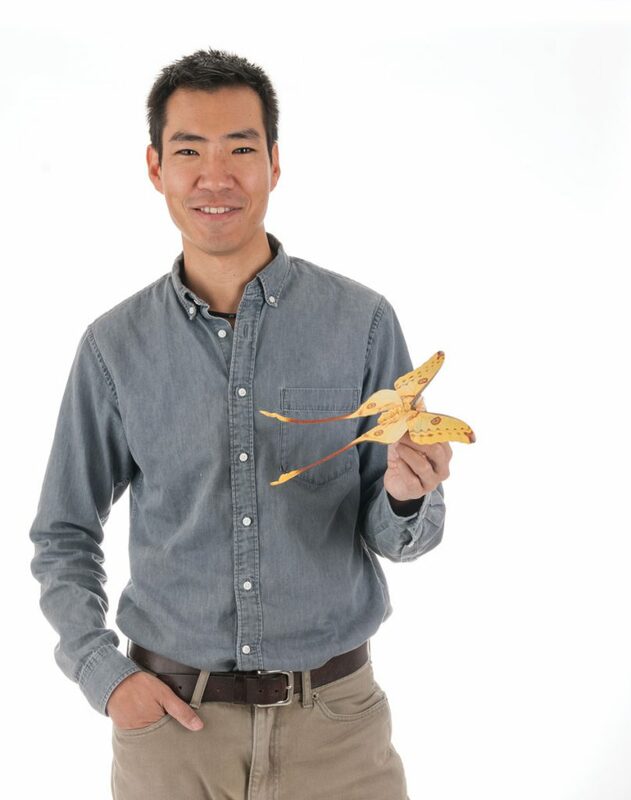 In one project, Kawahara and museum informatics curator Robert Guralnick are using a $2.5 million grant to create ButterflyNet to study the evolution of nearly all butterfly species by sequencing their DNA and collecting trait data. The goal, Kawahara says, is to build an extensive database of butterfly knowledge for each of the approximately 18,000 species: host plants, distribution, conservation status, and especially DNA. In the other project, with Associate Curator Jaret Daniels, a $3.3 million grant is supporting the digitization of nearly all North American butterfly and moth specimens in the McGuire Center to capture specimen label data for studies on how butterflies and moths are influenced by changing climate. One of the fundamental things scientists still don’t understand is how butterfly species are all related. Getting DNA from each species and using it to construct a family tree can paint a picture of evolution and help with butterfly conservation. “If we don’t have a family tree to know which species are closely related, we don’t have good ways of conserving a species that is endangered,” Kawahara says. A family tree can be useful, for example, if a species is endangered and its host plant is unknown. In that case, a researcher can look at the closest relatives to find likely candidates for host plants. Knowing genetic relationships can also help in cases where a species has not been collected in a long time; knowing close relatives can help target the habitat to search. Kawahara says butterflies and moths are also very sensitive to change, making them important early indicators of disrupted habitats. Some species, he says, are used to assess the condition of forests, for example. “Some species are acutely sensitive to temperature, and if butterflies and moths start to decline, they can serve as indicators of an impact on a landscape or climate change,” Kawahara says. “We regularly see many examples of butterflies changing their distributions in response to climate change. Butterflies from warmer climates are moving northward,” Kawahara says. Butterfly collections document habitats where nothing has been built and nothing has changed – national parks, for instance – but the butterflies are vanishing. Kawahara’s relationship with butterflies goes back to childhood trips in Japan with his father. He caught his first butterfly, a snout butterfly, at the age of 4. Soon after, his father bought him a butterfly net, which focused his attention keenly on each butterfly. “That net was a big deal. Whatever falls into the net, you end up looking at. We need to get our kids to use butterfly nets to study the nature around them,” Kawahara says. A couple of years later, his father walked into a shop in Tokyo and bought a field guide on butterflies, complete with dissections and diagrams in the back, sophisticated perhaps, but perfect for the 7-year-old lepidopterist in the making. “That book is really important to me,” Kawahara says. “I carried it everywhere. It opened the door to all this diversity. It wasn’t just this snout butterfly or the white butterflies in the garden, there were hundreds, thousands out there that I didn’t know about. “It opened the world of natural history,” says Kawahara, whose undergraduate thesis was on the snout butterfly. 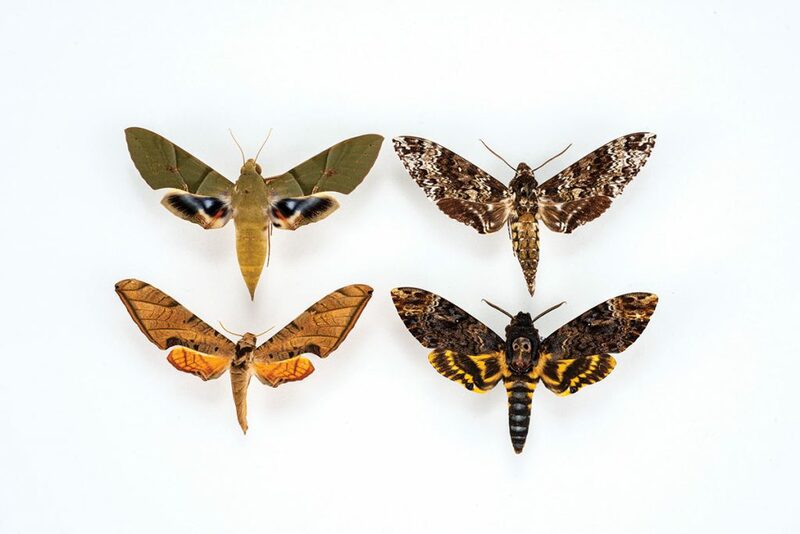 Kawahara describes college as “four years of just amazing, being around all these students all talking science,” and says it was there that he realized he could have more scientific impact studying the poorly understood moth than charismatic butterflies. Today in McGuire Hall, the newest museum building, there is room to grow, and Kawahara gets calls almost weekly from people who want to donate collections. 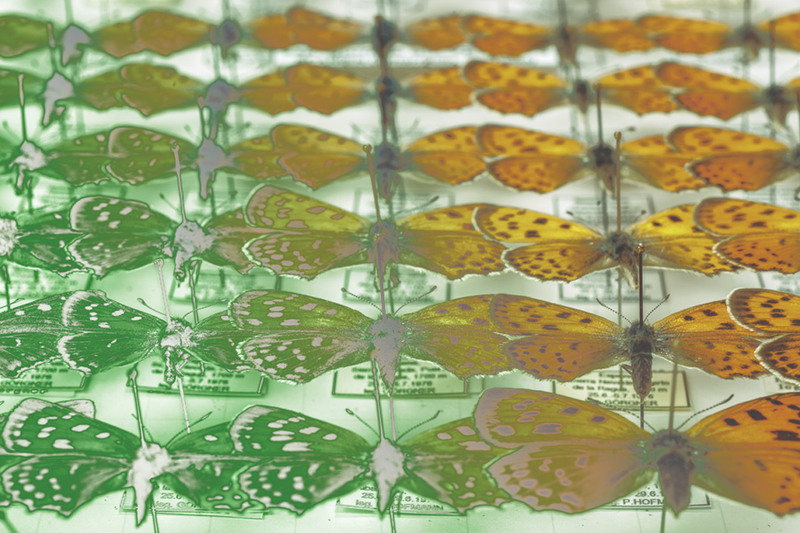 Collectors, he says, don’t want their specimens to disappear into a museum drawer; they want them to be used by students and researchers, and the McGuire Center’s collection fits the bill as the most used butterfly collection in the world. “Everybody that studies butterflies in the world knows about this place. There’s no other place like this,” Kawahara says. 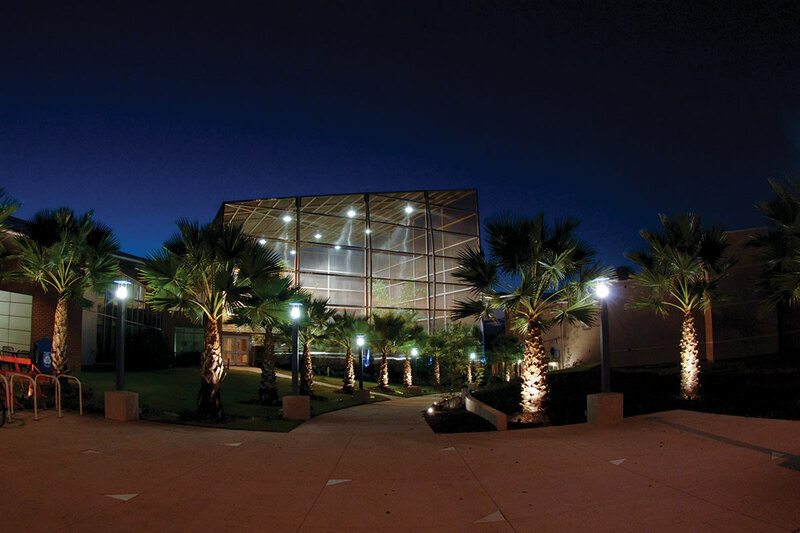 The collection is next door to the Butterfly Rainforest, a 6,400-square-foot screened exhibit with 1,000 butterflies and moths at any one time. Sometimes, when he needs peace to write, Kawahara sets up his laptop on one of the benches. At dusk in the Butterfly Rainforest, the butterflies retire for the evening and the moths take the night shift. More moths pollinate flowers than butterflies, Kawahara says, and pollination has its own pattern, with some moths flying from 10 to 11 p.m. and others from 3 to 5 a.m., according to their own internal clocks.